Article originally published on Spoon University. 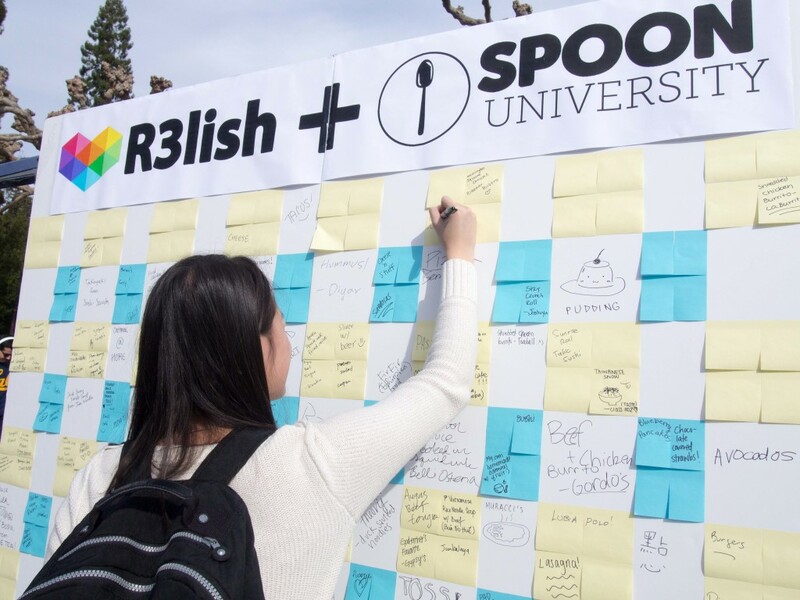 On February 11, 2015, Spoon University at Berkeley officially launched its partnership with R3lish, a San Francisco-based company that allows users to create, share and search for video- and photo-based restaurant reviews in its mobile app. After Spoon‘s Vice President of External Affairs, Hanna Ye, connected with R3lish’s marketing representative, she reached out to the founder of R3lish, Mike Leeds. Both Ye and Leeds decided to work together after seeing the potential in a mutually beneficial partnership. To spread the word about the partnership, team members from R3lish and Spoon spent the day on Upper Sproul on UC Berkeley campus, asking passing students about their “favorite go-to dish” in the area. The answers, noted on brightly colored Post-Its, ranged from simple – falafels – to decadent – Lemon Gingerbread Pancakes with Poached Pears. Each participant was given a bag of Pretzel Crisps, and many students were happy to share more of their favorite food experiences in a video interview. “I’m really looking forward to this,” Leeds said upon first arriving. He and his team arrived at 10am with cameras, as well as stickers and shirts bearing the colorful R3lish logo, which were offered to the video interviewees. 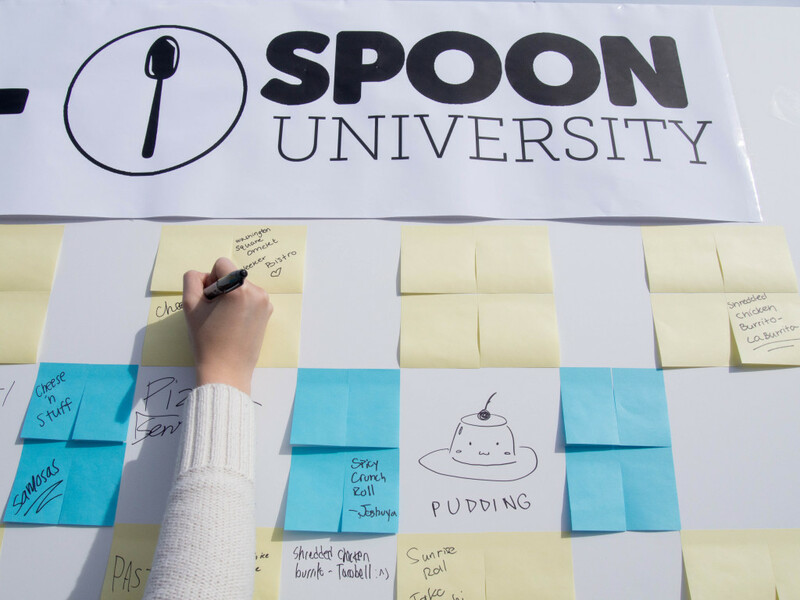 The Spoon team packed up at 3pm, board covered with drawings of food and neatly-penned meals from hands all across campus. As a second part of their partnership, R3lish and Spoon University at Berkeley kicked off a photo contest named #FoodsofBerkeley on Monday, February 23. Participants can upload a photo of their favorite dish in Berkeley to Facebook and tag #FoodsofBerkeley, R3lish and Spoon University at Berkeley to compete for the highest number of likes. The grand prize winner with the most likes at the end of the three-week competition (Friday, March 13, 2015 at 11:59pm) will receive a $250 gift card to his/her restaurant of choice. The following top 20 contestants will be treated to an exclusive dinner (maximum $30, with a plus one) sponsored by R3lish. In addition, the first 40 participants will receive complimentary coupons for free drinks from Sharetea or Tea Press. All of the participants will also have the chance to win one of two $25 gift cards from NorthSide Cafe, one of three $25 gift cards from Gather or a gift card from La Méditerranée in a random drawing. For more details about the competition rules, results and how to pick up your gift, please check out the Facebook event and click “Going” to receive regular updates. Good luck, and happy eating! I am a written and visual content creator documenting food, media, pop culture, publishing, and education.